Still working through your holiday shopping? 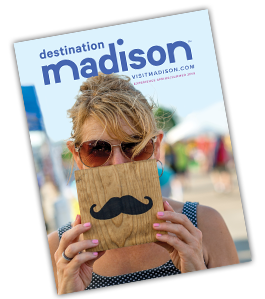 Madison has something for everyone on your list. From foodies to artists, our diverse shopping experiences have you covered. Shop, explore, and enjoy all Madison has to offer this holiday season. Have a bookworm on your list? A Room of One’s Own Bookstore has the answer. This independent, local bookstore features 6,000 square feet of new and used books. From classics to current work, you’ll find what you’re looking for here. Fromagination is your downtown go-to for Wisconsin’s favorite food – cheese. Selections feature award-winning cheeses from around the state as well as local artisans. They’ve even put together gift packages for the holiday season. It’s not the holidays without sweets. Satisfy everyone’s sweet tooth at Kilwins. Chocolate treats, caramel, popcorn and brittles, and more will bring a sweet smile to everyone’s face. And don’t forget your famous Mackinac Island-style fudge made fresh in the kitchen. For specialty gift, look no further than Little Luxuries. With purses, accessories, toys and more you’ll find unique options for the special people in your life. If you’re looking for something different this holiday season, this State Street staple is the place for you. Madison Museum of Contemporary Art features an extensive collection of stunning art pieces. It also features an award-winning museum store. Handcrafted local items, fine jewelry, and more are available for the creatively inspired on your gift list. Fair-trade-conscious shoppers will find works from around the world at Serrv. Their hand-crafted offerings are diverse and distinct. Want a unique spin to your holiday gifts? Serrv is for you. Open the door to a world of sensational scents at The Soap Opera. Looking for a fantastic fragrance? Candles and oils will brighten your home. Want distinct, delectable smells for everyday use? Artisanal soaps and child-friendly bath products will do the trick. Tailgate Clothing offers everything Madison with a vintage twist. Need a shirt for the Badger-lover on your list? Does someone want to represent their Wisconsin pride? You’ll find everything you need here. Love the University of Wisconsin? Showcase it with an array of Badger-themed goods at The University Book Store. Don’t forget to check out the miniaturized favorites from Bucky on Parade. If you need selection, look no further than East Towne Mall. With more than 100 stores you’ll be sure to find what you need for everyone on your list. Do you love local? Want to support local creatives? One-One Thousand is currently offering a downtown holiday shopping experience away from the studio through the Good Day Collective (at 1 N. Pinckney) that runs through mid-January. Support local artists and bring something unique home for the holidays. For those with artists on their list, Tandem Press is the place to shop. Tandem Press works with UW-Madison students and master printmakers to create a captivating collection of prints. Nothing satisfies a sweet tooth like chocolate. Gail Ambrosius Chocolatier creates handmade chocolate to delight the loved ones on your list. Check out the special Merry Everything packages this holiday season. Upscale shoppers should head over to the Hilldale Shopping Center. Draped in holiday lights and full of national and local retailers, this is a true holiday shopping experience. Orange Tree Imports is one of Madison’s favorite specialty shops. Locally-owned and nationally-renowned, Orange Tree Imports ranks as one of America’s 10 best kitchenware stores by Food Network. Check out what all the buzz is about. The University Book Store in the Hilldale Shopping Center is your place to take care of your Badger shopping this holiday season. Everything you need to showcase your love of the University of Wisconsin is right here. The Greenway Station Shopping Center provides an outdoor mall shopping experience dressed up with holiday cheer. Explore more than 35 national retailers ranging from home décor to fashion in this charming shoppers’ paradise. Looking for crafts and antiques to inspire the artist on your list? Look no further than the Odana Antiques & Fine Arts Center. With more than 28,000 square feet of items predating 1969, you’ll find exactly what you were looking for – and so much more. West Towne Mall is a robust shopping center of more than 120 stores and food options. Dynamic offerings will help you find something for each person on your list. In the spirit of the season, the mall is hosting extended shopping hours and holiday events. For the watersports enthusiast on your list, SkipperBud’s has the answer. Safety items, electronics, parts, and water toys are all available to help you make a splash for the holidays. A taste of the old world is sure to make the holidays special. Willkommen to Bavaria Sausage. More than 1,000 authentic German foods and specialty meats are perfect for the traditionalist on your list. Noble Knight Games is a table-top haven for lovers of classic, new, and unique games. With the world’s largest selection of tabletop games, you’ll find the perfect game for the table-top fan in your life. Are you a cost-conscious shopper who still wants name brand goods? Head to Outlets at the Dells. Some of the world’s most notable brands at 30%-70% discounts. If there’s an antique collector on your list, you’ll love the Columbus Antique Mall Museum. The world’s largest antique mall is 78,000 square feet of curated items from around the state. Find the perfect piece of Wisconsin’s history to share for the holidays. Help your loved ones stay warm this winter with a gift from Duluth Trading Company. From head to toe, Duluth Trading Company offers everything you need to keep those on your list comfortable. Why not gift a piece of Wisconsin to your loved ones this year? We’re talking about cheese, of course. Ehlenbach’s Cheese Chalet is family-owned and features more than 100 Wisconsin-made cheeses, sausages, candies, and more. Give a gift from the earth this holiday season with Ruby Rose Gallery. Gemstones, crystals, and unique jewelry and home décor, you’ll find everything you need for the earth-lovers on your list. WiscoBoxes are your ticket for purely Wisconsin gifts. Carefully curated products from local growers, producers, and artisans help you share the state you love, with the ones you love.